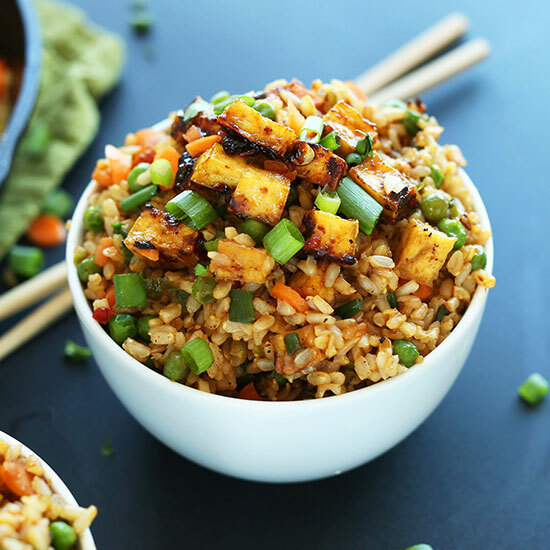 This Quinoa Fried “Rice” is a healthy take on everyone’s favorite Chinese takeout! It’s easy to prepare, and every bit as delicious as the original! Bring quinoa and water or chicken stock to a boil in a medium saucepan, and then reduce to a simmer. Season with salt. Simmer for 15-20 minutes until quinoa is fluffy and cooked through. Remove from heat and fluff with a fork. Transfer to a large plate and pop in the fridge or freezer to chill completely. Mix soy sauce, and sesame oil in a small bowl. Set aside. Heat ½ tablespoon olive oil in a large sauté pan over a high heat. Add onion and carrot, cook about two minutes. Add 2 scallions, garlic and ginger to the pan. Cook another two minutes. Add in the rest of the olive oil and the quinoa. Stir-fry about two minutes. Add sauce and stir-fry until incorporated, about two minutes. Make a well in the center of the quinoa pour eggs in, scramble. Throw in peas, then toss everything together until the peas are warmed through, add remaining scallion and serve. 0 Response to "QUINOA FRIED “RICE”"